Researchers at UC Santa Cruz have determined the structure of a key part of the enzyme telomerase, which is active in most cancers and enables cancer cells to proliferate indefinitely. The new findings, published October 5 in Nature Structural & Molecular Biology, reveal how the enzyme carries out a crucial function involved in protecting the ends of chromosomes. Repetitive DNA sequences at the ends of chromosomes, called telomeres, serve as protective caps (often compared to the plastic tips on shoelaces). As cells divide, their telomeres get progressively shorter, until eventually the cells stop dividing. The telomerase enzyme lengthens telomeres by adding more of the repetitive DNA sequence. It is active in cells that need to keep dividing indefinitely, such as stem cells, and in about 90 percent of malignant tumors. "Since the discovery of telomerase and its over-activation in cancers, people have recognized the huge therapeutic potential for anticancer drugs that target telomerase. But there still is no such drug in the clinic, and part of the reason is our lack of understanding of the detailed structure of the enzyme," said Michael Stone, associate professor of chemistry and biochemistry at UC Santa Cruz and senior author of the paper. Telomerase is an unusual enzyme in that it is composed of a protein component and an RNA component. The protein is a type of enzyme called a reverse transcriptase, which makes DNA copies of RNA sequences. The RNA component provides the template that the enzyme copies to generate the telomere DNA sequence. "The template is the track that the enzyme train runs along, and what's so unique with telomerase is that the track is an integral component of the enzyme itself," Stone said. The enzyme copies the same short segment of RNA template over and over again to generate the repetitive DNA of the telomere. One of the mysteries has been how the copied sequence is so precisely defined, since it is a relatively small segment of the much larger telomerase RNA. Stone's group solved the structure of a region called the RNA binding domain, and their findings explain how the boundary of the template is defined by the interplay between the protein and RNA components of the telomerase. Essentially, the binding domain tethers one end of the RNA so that only a defined sequence can move through the active site of the enzyme where copying takes place. 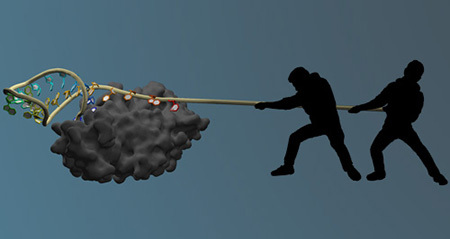 As the enzyme copies the template sequence, it pulls the RNA through the active site until there is no more slack left, at which point a molecular "tug of war" between the binding domain and the reverse transcriptase stops the movement of RNA into the active site. "The reverse transcriptase is pulling on the RNA, but the structural resistance of the RNA binding domain prohibits the movement of more RNA, and that's how the template boundary is defined," Stone said. The enzyme then resets to the beginning of the template sequence and starts over. Stone's group showed that the section of RNA that is tethered to the protein forms a structure known as an RNA stem loop, and a protein structure in the binding domain is wedged into the base of the RNA stem, anchoring it in place. "Our model is consistent with the findings of other studies of telomerase and directly reveals the functional mechanism involved," Stone said. "What makes this interesting for rational drug design is that template boundary definition is a very specific feature of telomerase. Our cells are full of other kinds of polymerase enzymes, so it's important to design a drug that targets only telomerase." Linnea Jansson, a graduate student in molecular, cell and developmental (MCD) biology at UC Santa Cruz, is first author of the paper, which Stone said is the culmination of more than six years of work by numerous researchers in his lab. 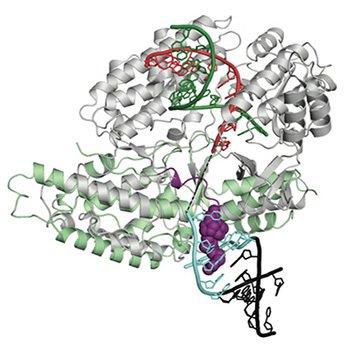 The researchers performed x-ray crystallography to determine the structure of the RNA binding domain, using the Macromolecular Structure Function Core Facility at UC Santa Cruz. In addition to Jansson and Stone, the coauthors include Ben Akiyama, now a postdoctoral researcher at the University of Colorado School of Medicine; Alexandra Ooms, who worked in Stone's lab as an undergraduate and is now at Stanford University; postdoctoral researcher Cheng Lu; and Seth Rubin, associate professor of chemistry and biochemistry.